I suddenly decided to go on holiday. I was solely looking at booking Toronto or Cairo (I know, both really similar places… NOT!) But I ended up booking Aruba instead, only 36 hours before flying! What a whirlwind! 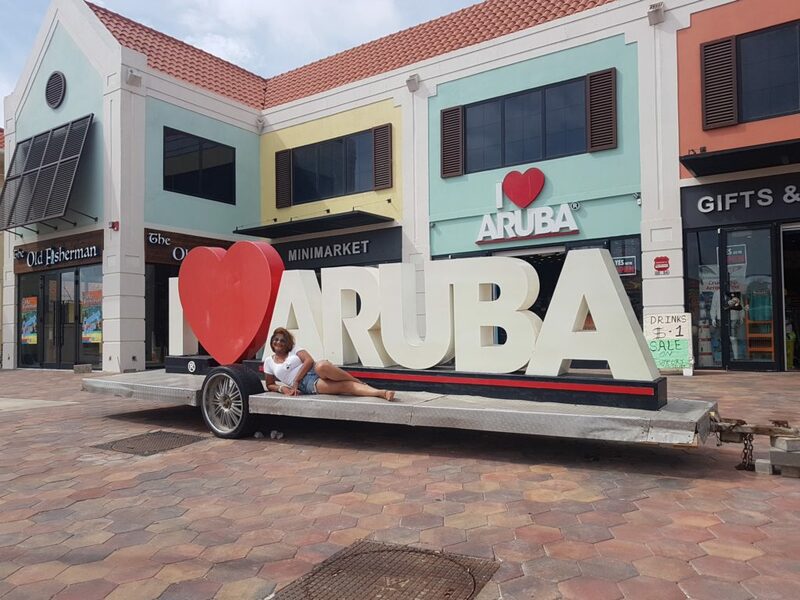 I’ve been to a few Caribbean islands; Antigua, St. Lucia, Jamaica and The Bahamas, so I had no immediate inclination in wanting to head back in that direction, until last week when I ended up booking Aruba! I’d NEVER even heard of the capital Oranjestad! So I managed to get a super hot flight price and then I booked an apartment for 7 nights as I wanted to experience a non-hotel holiday. It’s a direct 9hr flight, which is fantastic as you don’t waste hours of precious holiday time being stuck in transit! A bit of sleep and 3 of the latest blockbuster films later, we landed in Oranjestad the capital of Aruba! After landing at Queen Beatrix Airport, I got a taxi to my apartments which were about 10km away; this cost $35 one way. I was staying at the Carinas Aruba, these are owned by Ron & Rosemary C who were a lovely couple Dutch and Irish respectively! 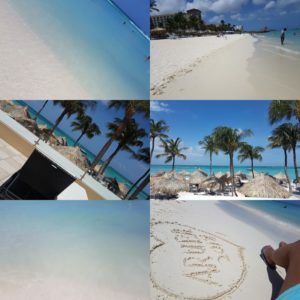 Their apartments are situated in the Palm Beach area, which also hosts one of the top beaches in Aruba and it’s literally only a 5-7 min walk to this particular gorgeous beach! There were also plenty of shops, restaurants and bars within a few mins walk as well, however, the apartments are situated in a quiet residential area. After settling in and having been welcomed by the very kind Ron and a most welcome, welcome drink, I headed off for a wander around to get my bearings. It literally took 5 mins to walk through the shops and restaurants to head straight for that beach! When I got my first glance of the whole beach, it absolutely took my breath away! The sand is white and so powdery beneath your feet! The palm trees swaying softly in the breeze and most beautiful of all, the ocean stretching out endlessly in front of you, in graduating shades of azure! Nothing I say could adequately express how stunning this beach is, it was simply stunning! I have been to other Caribbean islands but none have touched me as much as Aruba! I decided to have a very late lunch/early dinner at a bar on the beach, which was absolutely gorgeous! Fish Tacos! Something totally unique! Afterwards I ended up walking along the beach and going to watch karaoke ‘Aruba style’ at another popular bar Moomba Beach. Next morning, I got up and headed for breakfast at Ché Bar Restaurant Argentina. The Pancakes and French toast as well as the other breakfast options were amazing! All home cooked and very reasonably priced! I enjoyed it so much that I ended up eating breakfast there for the majority of my stay! I relaxed at the beach for the day. I simply needed the relaxation time, although to be fair, there are plenty of activities beach-side to keep you occupied in amongst the relaxation. For example, parasailing, jet-skiing, as well as the usual banana boat rides, kayaks and paddle boards Me? I chose to chill. That night I headed to the main restaurant area where I ended up having a lovely Thai meal, whilst watching a live singer crooning away; it was lovely! I then headed onto a bar called Sopranos Aruba where a live pianist was pandering to his predominantly American audience, but he was absolutely brilliant. 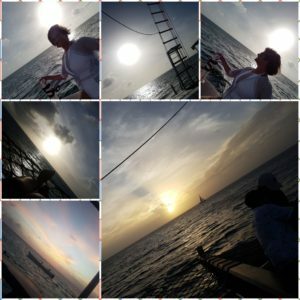 Not sure if you’re getting the feeling that I was absolutely loving Aruba! The place could do no wrong! I met some lovely people that night who gave me several recommendations for the rest of my stay, which I did act upon! 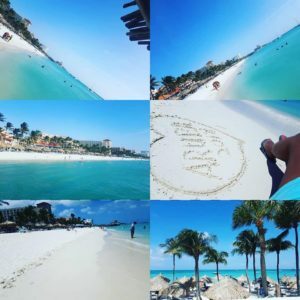 Aruba’s motto is “One Happy Island” and it’s just so true! Every single person on the island is so friendly and happy to help! Staff go out of their way to assist you in shops, bars and restaurants, and even drivers on the road are incredibly considerate; they actually slow down and allow you to cross the main roads, no matter how fast they were coming along! I’ve NEVER seen that in any other country in the world! For the whole duration of my trip, I felt safe and able to ask for help, whenever or wherever needed, because everybody is just so super friendly and approachable. Perfect for solo travellers! Ron had organised a special tour to San Nicolas for me and others who were staying in the apartments, whilst Rosemary, his other half drove us there. San Nicolas is around a 40 minute drive from Palm Beach at the south-east end of the island and as with most other parts of the island, you can actually get buses there. We were lucky enough to be given an in depth tour of San Nicolas by Leon Berenos, a leading local almost ‘celebrity.’ Leon gives fascinating insights about Aruban history starting from San Nicolaas Stores, and then walks you around the colourful streets regaling you with the historic facts regarding Aruba! 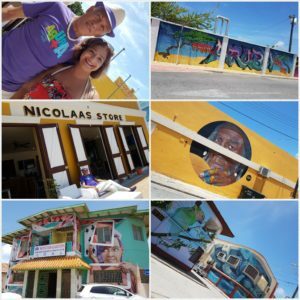 Aruba Art fair was launched in 2016 , bringing artists from all around the world, as well as local artists to light up the buildings and streets with their amazing talent! The main buildings and walls surrounding the main street have been covered with the most beautiful murals and mosaics; well worth a visit! 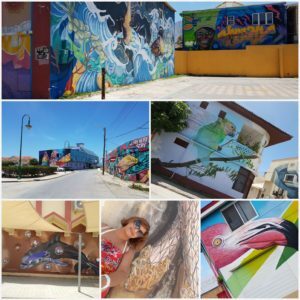 A morning seeing the street-art could easily be combined with lunch at the popular Charlie’s Bar, and a relaxing afternoon on Baby Beach! Leon also gives you the chance to visit a local gallery to purchase any little hand made souvenirs or works of art. After the tour we headed back to the San Nicolaas store for a delicious light lunch! Definitely a ‘Must Do’ tour! The next day I took a bus into Oranjestad the capital for some souvenir shopping. It’s so quaint that it’s almost ‘Disney’ looking with it’s painted buildings. There’s the large shopping mall with designer brands or lots of smaller souvenir shops. There’s also a local souvenir market, ideally situated near where the cruise ships dock! It really doesn’t take long to wander around Oranjestad, although most of my time was spent bartering in the plentiful jewellery shops! One is a veritable magpie! That evening I had booked to go on a Sunset cruise from Palm Beach. I used Jolly Pirates Sailing Cruises & Snorkelling. Again, I had an amazing time! I stayed laying on the hammock hanging over the water watching the sunset. So relaxing! It was one of the most beautiful and relaxing moments I have EVER experienced! An added bonus was that it was a free bar and my very own sea ‘butler’ kept on bringing me my drinks! Another definite ‘Must Do‘ on a Sunday in Aruba is the A La Carte Brunch at Tierra Del Sol. 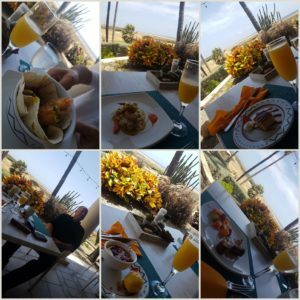 This resort offers world class international cuisine, with spectacular views of the Caribbean sea and also the historic California Light House. Plus it’s situated on an 18 hole championship golf course! And my word, it was heavenly and such a wonderful romantic setting! …maybe you’re beginning to get the faint idea that I LOVE Aruba! The one ‘touristy’ thing on Aruba that I didn’t succomb to, was go to Rennaissance Island to see the six, yes six flamingos ! Not only did I NOT wish to partake in the tourist trap of hassling these poor birds for photos, it was also an incredible $125 for that privilege, unless of course you just happened to be staying at the Rennaissance Hotel! 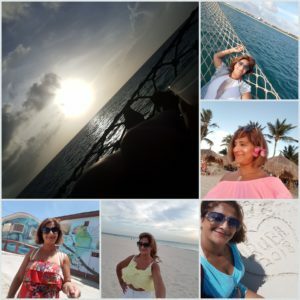 Points of interest in Aruba! If you love nature and wildlife then you shouldn’t miss this landmark in Aruba! The Arikok National Park is a rugged desert like cactus filled part of Aruba, it covers about 20% of the south east of the island. It’s home to all types of flora and fauna including rattlesnakes, parakeets and lizards and geckos. You can walk through the park or drive through with a four-wheel drive. Access to the park costs $10. There are also many Natural Attractions in Aruba as well as man made! The Natural Pool is also situated within Arikok National park it is a gorgeous emerald pool shielded from the sea by the surrounding rocky landscape, a striking calm in total contrast to the rugged scenery around it! But, you definitely need four wheel drive transport to visit it! The Spanish Lagoon is another point of interest. This was once the gateway for the Spaniards to enter Aruba, nowadays paddle boarders love meandering around it! The California Lighthouse perched high over the sea, the old stone lighthouse has become one of Aruba’s most well-known landmarks. From its vantage point, you can take in the stunning postcard-worthy views of the island’s western coastline, sandy white beaches, rocky shorelines and the championship golf course, Tierra Del Sol. The Alto Vista Chapel The name alto vista means high view. When you stand in front of the chapel the back drop of the waves crashing against huge rocks is amazing! The small yellow chapel is located on the north-eastern tip of the island close to the town of Noord and the Arikok National Park. Alto Vista, also often called ‘pilgrim’s church’, it’s located at the end of a long, winding road. White crosses mark the route. The current building dates from 1952, but the location has a much longer history, as this is where the first church on Aruba once stood! 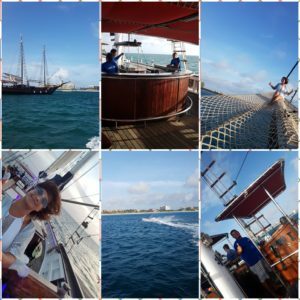 For the more adventurous of you, then Watersport Activities are some of the most popular things to do in Aruba! For Snorkelling You can either head out to one of the many shallow parts in the ocean on your own, or you can choose to go on an excursion. This includes a couple of snorkelling stops, and then a sunset dinner! This also gives you the opportunity to enjoy views of the stunning coastline. These excursions usually include a snorkelling stop at the SS Antilla. The SS Antilla is a popular point of interest in Aruba. The wreck dates back to the Second World War and is a sunken German cargo ship. It’s also the largest shipwreck in the Caribbean, and in the top three in the world, making it a very popular diving site for both snorkellers as well as scuba divers! There’s so many options on ‘The One Happy Island’ of Aruba. I had a magical time and I look forward to returning there in the near future! Great review. Very comprehensive. Been to Aruba myself but we just hit the beaches, casinos, restaurants and shops. Did not realize there are so many other things to do.